Here at Mawdsleys, we specialise in Armature Rewinding – repairing all models and brands of DC motor in our on-site winding shop. Our expert team of engineers have many years of combined experience in the industry, with a fast turnaround to get your business moving again. Armature Rewinding will extend the operating life of your motor, reduce underperformance, and prevent an unexpected breakdown in the future as well as extending Carbon Brush life. Motor comes into the workshop, armature is inspected. Coils are then and pressed into U-bends, looped, soldered, shaped and taped to the correct insulation requirement. Top bars are then fitted into the commutator. Armature is then electrically drop tested and flashed to check for any faults. Commutator bars are then cut ready for soldering. Armature is then immersed in varnish and baked for a minimum of 8 hours at 160c. Excess varnish is removed and commutator is then skimmed and undercut. Following undercutting, each section of the commutator is then de-burred. The armature is drop tested once more to ensure there are no short circuits. Finally, the armature is reassembled and electrically and mechanically tested before being despatched. Below you can find some of the most common causes of armature damage, along with what triggers them to occur and how you can identify them early to prevent motor failure or the need for a premature rewind. Worn commutators are one of the most common causes of armature failure. When commutators become worn or damaged, they wear down carbon brushes much quicker which can result in a damaged or destroyed armature. Commutator wear can be caused by a number of conditions including overloading, contamination, excessive vibration and incorrect carbon brush size or brush gear. Signs that your commutator is being worn down or damaged include raw grooved or streaked surface, presence of burn marks, bar marking or patchiness. 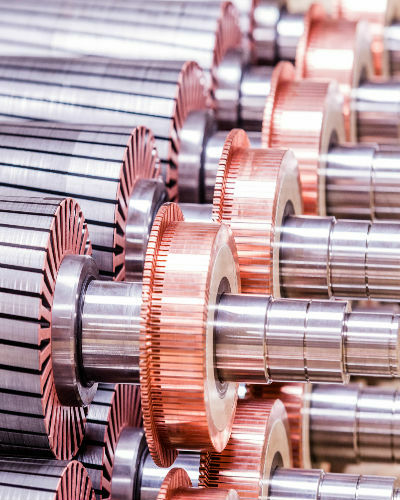 overheating, carbon brush wear and sparking, damage to commutator and winding faults; all of which can result in damage to the motor’s armature. Excessive noise and vibration can be caused by a number of things including damaged bearings and coils, bent motor shafts, improper alignments, weak motor base and electrical imbalances. If you notice a change in the sound or vibration levels of your motor, you should have it serviced. Regular noise and vibration testing ensures that these subtle changes are picked up before they develop into something serious. Running a motor with a worn carbon brush can damage or destroy your armature, an armature rewind or replacement is much more expensive compared with replacing your carbon brushes, so keep an eye on them and contact us for advice if you’re not sure when your brushes need replacing. Carbon Brushes are subject to abrasion from moving parts in a motor, because of this, they wear over time. Carbon brush wear can also be sped up by worn commutators and incorrectly sized of fitted brushes amongst other things. Signs that your carbon brushes are beginning to wear include sparking of the brushes when in contact with the commutator, the presence of carbon dust and a decrease in power or complete failure of the motor. This can be caused by a number of problems including, overloading, poor airflow in the motor, regulator failure, stalling and insulation breakdown. If your armature has burned out then it will need a rewind. Earthing or grounding occurs when part of the winding becomes connected to the metal core of the armature. If your armature does need rewinding, our rewinding service is designed to help you get your motor up and running again as quickly as possible. We have invested in numerous technologies which allow us to carry out the majority of rewinds in-house, resulting in a quicker turnaround, and giving you the peace of mind of dealing with one contractor throughout the rewinding process. Additionally, we are able to manufacture our own armature coils for DC motors and generators, meaning in most cases, there will be no delays in the process waiting for parts to arrive. If you’re experiencing a problem with your armature, or any underperformance from your motor, give us a call on 0117 955 2481 and we’ll recommend the best course of action to get your motor up and running again. Alternatively, fill out a contact form and we will get back to you.